The name, NEXGEN, of NEXGEN Biotechnologies, Inc. (hereafter NEXGEN) comes from the term ‘Next Generation’. Like the name, NEXGEN applies the second generation plant genetic technology beyond the first plant genetic technology to the industry as a next generation biotechnology venture company. Let’s take a look at the second generation plant genetic technology. The first plant genetic technology just regarded the plant as a food source, and developed methods to enhance the productivity like development of the herbicide, resistance, disease resistance and insect resistance. However, the second generation plant genetic technology regards the plant as an industry resource, and produces the medical, industrial and agricultural material using the plant as a manufacturing plant. It means that other materials, which are beneficial for human, are produced from the plant cells. Specifically, by introducing the useful protein gene, originated from human to plant, the high value added useful protein is produced such as insulin, interferon, growth hormone and body enzyme for medical use, and the ‘Edible Plant Vaccine’ which gives the vaccine effect on specific diseases is produced as well. NEXGEN has various original technologies in the gene synthesis, promoter for expressing through the plant genome research, gene introducing technology in bean sprout and plant for the material production, and NEXGEN has a global reputation in the molecular farming area. The popularization of the high quality protein for medical use is a business target through the process by producing the high value added medical protein inexpensively, supplying some of them to existing medical protein market, and developing the others as new materials for the functional cosmetics. NEXGEN has been established since 1999, which was 2 years later since Microgen, which is called the first generation bio company, in Daejeon, when the biotechnology venture boom started. When NEXGEN was established, there were 500 biotechnology companies; now, fewer than 10 of those have retained their initial management, and most of the companies have disappeared. Therefore, many people are curious about NEXGEN because NEXGEN is still good in business, and NEXGEN is one of the companies which have kept the same CEO after the establishment. Most companies go out of business within 2-3 years of their founding; however, the reason for which NEXGEN have kept the business until now is firstly due to the CEO’s ability and willingness, and secondly due to the stockholders, who helped each other. One of the factors was that NEXGEN didn’t receive the investment like a venture capital firm, which gets out of the business once the investment is retrieved, by concentrating on only making money during the short period, rather than sharing the vision for the business itself. In the initial period after establishment, NEXGEN developed firstly the reagent, which analyzes the GMO (genetically modified organism) such as beans and cones. From this, NEXGEN was called Korea Gene Analysis Center, and acted as GMO analysis institution, accredited by KFDA. Although NEXGEN didn’t make as much profit as expected, it was a chance to introduce the NEXGEN name to the outside. After that, NEXGEN developed a disease diagnosis kit. The representative kit was produced for thyroid disease diagnosis which was developed by recombining the thyroid stimulating hormone receptor (TSHR) protein with the plant (tobacco). This NEXGEN technology was selected as one of Korea 10 new technologies from the Ministry of Commerce, Industry and Energy (present, Ministry of Knowledge Econ omy) in 2005. Korea 10 New Technologies are the world’s first and best advanced new technologies that have been announced every year since 1999 by the government, and these are promising new technologies with high expectation of an economic and technological value, which are developed and commercialized in Korea for a year. NEXGEN was also awarded as a National Research Laboratory by the Ministry of Commerce, Industry and Energy in the same year. The national research laboratory is a supporting system by introducing the excellent laboratory to strengthen the research capacity of the core fundamental technology area, which should be promoted strategically in the country, and the research project was ‘Development of Avian Influenza Using the Plant. At present, NEXGEN has 30 different proprietary rights. In 2008, NEXGEN moved the business area into Seoul from Daejeon. Although there had a problem due to the limitation of the employment, it was for promoting the marketing when the research result was applied to the business. After moving the company, the next business area was functional cosmetics. The connection with cosmetics was started 4-5 years before in Daejeon. One of the local large cosmetic companies visited NEXGEN and recommended that “We know you are producing EGF (Epithelial cell Growth Factor). We want to produce a high functional cosmetic, which has an excellent effect for the cell generation and anti-aging with EGF ingredient; therefore, I suggest your company to participate in bidding”. This time, NEXGEN was successfully contacted after bidding, and EGF cosmetic has been supplied until now, Moreover, NEXGEN is supplying the raw material to the large sized cosmetic companies and the medium sized companies through the dealer, sales profit has been increased continuously till now. EGF is as expensive as 45 million won per 1g; therefore most cosmetic companies can’t add much of this expensive material because of margin. In other words, the amount significantly enough to give the desired effect could not be used. There is a term ‘Concept’, which is commonly used in the cosmetic industry, and the high functional cosmetic is only a tool of the advertisement for ‘Concept’, and we can’t expect the actual effect. “As I look at it from the seller’s view, I hope that it should be enough to give the effect, therefore, we decided that to make a right product by adding an enough amount. As a test, I gave the hundreds of essences to who had a name ‘Guardian’ to the people around me, and the people’s reactions were tremendous. So it had been started.” says NEXGEN CEO Lee Sun Gyo. NEXGEN Brand, What is different? NEXGEN started to produce cosmetics independently 2 years ago, and it was launched in the market from last summer. NEXGEN selected the target with hospitals and esthetic shops after thinking there is much less possibility to make the profit in the consumer market or Internet market. Firstly, NEXGEN produced the product related to whitening, regeneration and hair growth for hospital use; however, the general reaction was ‘Good but expensive. Most doctors, who concentrate on the treatment through the medical equipment and consider the cosmetic as a supporting method, tried to cut down the price. In the case of esthetic shops, they couldn’t use the medical equipment and they are looking desperately for the good and effective cosmetics. So both our interests fit. Therefore, NEXGEN have been produced specialized products for esthetic shops although NEXGEN supplies the products for some hospitals. “Before starting the cosmetic business, I studied the total ingredient analysis table of the foreign cosmetics, which have been known for good quality, and I found out they used lots of preservatives. Lots of companies advertised that they have lots of nutrient ingredients in their product; however, lots of nutrient ingredients mean that it is good condition for microorganism growth, which will degenerate the cosmetic. If there is no preservative, the cosmetic will go bad within a week. That’s why the tremendous amount of preservative, which is a toxic material, is added. Therefore, we decided that we make the product without preservative” says Lee Sun Gyo CEO. A proper non-preservative product can be achieved when all conditions such as nonpreservative, sterilizing process and disposal packing are done. If one microorganism exists, it soon becomes two, four, and then it increases exponentially. Therefore, even though product is sterilized, it is impossible to maintain sterilized condition in the instant of opening the cover. To solve this problem, NEXGEN launched the disposal packing product, which throws away after using once. Banned use of plant extracts is another NEXGEN’s feature. Many people memorize the nature, plant, plant like an incantation, and they are blinded by the plant image; however, while the plant supplies active ingredients, it also provides substances which are harmful to humans. To extract only ingredients which are beneficial to humans costs a lot, and the plant extracts are materials whose ingredients are not known with ingredients are not purified. 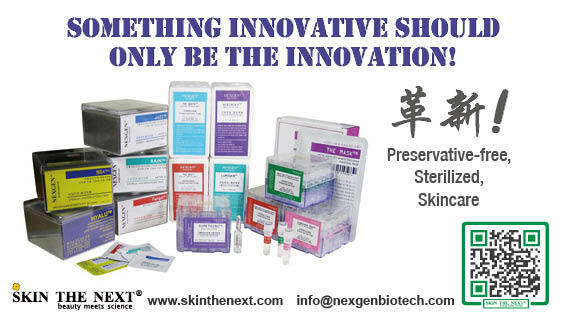 Therefore, NEXGEN produces the high function cosmetics, which reach the medical care area, not just simple skincare, by recombining the growth factor protein, which can help the regeneration ability of the cell itself and artificial cell solution (constitution with vitamin, mineral and amino acid), which constitute similarly with the human cell, instead of using the unknown plant extracts. NEXGEN developed independently 20 different growth factor proteins. NEXGEN is gathered with the specialized members who majored in molecular biology and plant engineering. As NEXGEN is a company concentrating on R&D, the company atmosphere is different from other companies, and as a venture company, the employees handle matters independently rather than bureaucratically. On the wall behind CEO Lee Sun Gyo’s desk, there is a sign that says, ‘Never Say Never’, ‘Never Stay’, and ‘Never Stop’, which means never say you can’t do it. This is also a challenging.